This was a lovely little town, a mini venice with canals and gonola type boats. This was a lovely little town, a mini venice with canals and gonola type boats. Lovely to walk through the narrow streets and visit the locals. We spent a wonderful day with Apple in Shanghai! Excellent trip. Also enjoyed a very good traditional Chinese lunch in a very nice restaurant. Loved this tour - it was our favorite, even thought it was a very long day. Loved this tour - it was our favorite, even thought it was a very long day. Supposed to be 8 hours, but heavy traffic turned it into a 10 hour day. Lunch was included and it was delicious!. I am afraid I missed something of what the tour guide said so I took off on my own. This was a unique tour and well worth doing. This was a unique tour and well worth doing. I think the highlight for me was the Silk Worm factory, that was amazing. It&apos;s far from Shanghai, but we had already visited Shanghai before. It&apos;s far from Shanghai, but we had already visited Shanghai before. 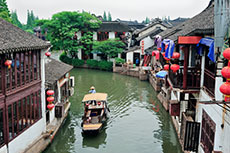 The water town is interesting, charming but very crowded as most tourist spots in China. You could buy your heart out with souvenirs and unusual food items. Lovely tour to a preserved, historic area.